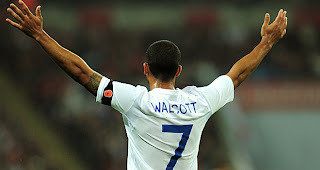 Andre Villas-Boas hopes to lure Arsenal winger Theo Walcott to Stamford Bridge as he looks to bring in more young talent as he looks to further everse the ageing nature of his Blues squad. The Portuguese boss has watched his West London side experience stuttering form thus far this season and after signing the likes of Juan Mata, Romelu Lukaku and Oriol Romeu is keen to invest in further squad additions as a number of the club’s old guard move into the latter stages of their careers. Chelsea were strongly linked with a move for Walcott over the summer and Arsenal’s poor start to the season coupled with the fact that the England international has less than 18 months to run on his current deal may assist Villas-Boas in his pursuit of the former Southampton man. Owner Roman Abramovich is ready to fund a £25m offer for Walcott who Villas-Boas appears to feel would fit in well on the right hand side of the Cgelsea attack, with the aforementioned Mata working well on the left since his move from Valencia. After an up and down start to his Gunners career but now in his sixth season at the North London club the 22 year old is an effective attacking weapon who performs on a more consistent basis as well as developing more in the final third and becoming a more consistent goalscorer too. Last term Walcott managed 13 goals and nine assists but will have been dismayed by Arsenal’s shocking start to the campaign and although Wenger has managed to turn the club’s form around there is still a very real chance that another season without silverware is on the cards and if the Frenchman fails to secure a top four finish at the very least then a number of the club’s top performers may consider their futures. Chelsea may feel the time is right to consider offers for the senior members of the squad who Villas-Boas is looking to replace in the long term and to this end the likes of Didier Drogba, Florent Malouda and Nicolas Anelka have been heavily linked with moves away either in January or next summer.